The day Martí­n Prieto and Myriam Martí­nez Elcoro asked themselves what linked Rosario to Asunción, they had no doubts: it was the river. A step had been taken and a laboratory was in the making. The idea was to create a regional project involving the network of Spanish cultural centers, and now they knew, the system that would join them together would be the river. The river as landscape, resource, story line, topic, slogan, medium, obsession. The river had to be rethought, from all its many angles. How could it be done? By navigating it, as the first Western explorers in the region had done. “Going upriver backwards”, as Jorge Fandermole said in a song composed on board the boat. Graciela Silvestri, author of El color del rí­o (The Color of the River) was given the task of examining those angles. It was she who invited diverse representatives of “arts, crafts and know-hows”to embark on exploring the river, its image, its figure, with the water under their feet. Paraná Ra’Anga, the figure of the Paraná, was the name given to the project. The use of the Guaraní­ name is no coincidence, as it is the language spoken in much of the region where the Paraná basin lies. Paraná, a Guaraní­ word that means relative of the sea or akin to the sea, is by no means a name without context. Ta’anga means image, figure, spirit, shadow, soul, and temptation too. “Figure”was the chosen synonym: in its declined form it is ra’anga. The figure of the Paraná thus became the chosen meaning. The book that served as a guide on giving shape to the project was Viaje al Rí­o de la Plata (Voyage to the River Plate) by Ulrico Schmidl, who wrote the first chronicle on this part of the world. Schmidl was a Bavarian who accompanied the first scouting expedition of the River Plate on the Magdalena; it is an expedition about which much has been written. So, under the auspices of the Centro Cultural Parque España in Rosario, the project began the task of drawing up a tentative outline: a frame of reference, practical needs, logistical issues, an agenda on land, etc. 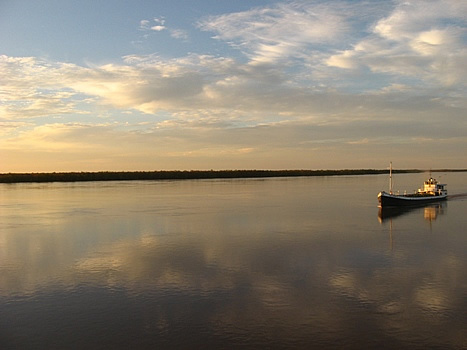 The aim was to spend the better part of a month on a boat that would sail the waters of the Paraná and then the Paraguay River from El Tigre, in Buenos Aires, to Asunción, Paraguay. Its passengers were invited to work from their own perspective, immersed in the landscape and in constant relation to other subjective themes. Some expedition members would be on board for the entire journey, whereas others would be present in stretches. The boat was to call at a few ports to provide the possibility of coming into contact with land. The journey was to begin on land on March 5, 2010 in Buenos Aires and La Plata. We would set sail from Tigre on the 8th and disembark in Rosario, Santa Fe, Paraná, La Paz, Goya, Puerto Barranqueras, Corrientes, Pilar, Formosa and Asunción. The document drafted by Graciela Silvestri for us to figure out the whys and wherefores of such an extreme endeavor provides a few interdisciplinary pivots around which our interests and practices would revolve. The first such pivot and perhaps the one that has crossed this journey most viscerally refers to the experience itself. This was to stem from the slow passing of time, a different relationship with time that forces one to hold still, and from living together with the other expedition members, intersections that would not have otherwise occurred. This aspect, which interested me greatly, was a bet on contingency. Nothing was planned in advance; everything would depend on happenstance. On saying “everything”, prior to the date of departure, we had no idea just how true this would be. More on this later. The second pivot was the relationship between representation and space. How should we represent space, and not just “space”, but the space to which we would be subjected? A space that in the romantic tradition signified a certain kind of immobility. What would happen here, when the space we would be facing is a transitory, mutable one? How does one represent movement? That pivot leads to another with territorial and political implications. The territory we would be crossing (or that would be crossing us) is a very different landscape to the one described by Schmidl. It has been outlined by the creation of nations, has shaped its cultural patterns, has seen one kind of economy develop rather than another, and has been racked by the violence of conquests, wars, dictatorships. Would it be possible to come up with another concept of region through a trans-disciplinary analysis of these territorial and political implications?